Today is the story of why I wrote an eBook about podcasting on WordPress.com? It all started with an email I received in the Fall of 2017. Shortly after I attended Podcast Movement 2017 in Anaheim California, I got an email from my website contact form that grabbed my attention from the very start. What makes a good email? Credibility. A university professor introduced himself and proceeded to tell me he listened to all 100+ episodes of my podcast. **Tip:** You never know who is listening to your podcast! Every listener is important. Flattery. The Professor (a teacher) went on to say he emailed me because I was passionate about teaching and helping people figure things out and because I had demonstrated qualities he respected: Knowledge, Motivation, Productivity and Personality. Wow, that felt good. **Tip:** If you want to get someone’s attention, feed them compliments…no, seriously, appealing to one's ego really works! Kindness. The Professor mentioned he was listening to an episode of mine right after I got back from Podcast Movement and something my voice sounded as if I was having trouble with something in my business and I needed help. He saw an opportunity how he thought he might be able to help me, so he reached out. Pretty cool. **Tip:** Podcasting feels lonely and you are not ever really certain anyone is listening. But the people who are listening and show up week after week feel like the know you. The power of podcasting. Intrigue.The Professor told me he inadvertently discovered a resource for podcasters that no-one seemed to be promoting and wanted to know if I thought it was a valuable resource that I might want to promote and teach others about. He needed about 30 minutes on a Skype call. **Tip:** If you want a podcasting tech nerd to say yes  to a meeting just tell them they have this super secret awesome thing that nobody is talking about but it’s a game changer and I’ll let you in on the secret if you give me 30 minutes to your time. Of course I was intrigue and replied back simply. Yes, I am interested in learning more and we scheduled a 30-minute Skype call. Introduce yourself as a human and make a connection with whoever you are trying to reach. Then give them a compliment or something positive and then offer them something of value or make it clear that you are not emailing a stranger and asking for a favor. And if you want to get a meeting a conference call, make it really hard for that person to say no. Professor: I have discovered an under-the-radar podcasting resource. Me: (I doubted it, but I kept an open mind)… Wow, that sounds great…tell me more. Professor: The podcast resource I am referring to is Wordrpess.com, which I’m sure you’ve heard of. It is cheap and dependable all-in-one podcast and website hosting solution that I have been using for my own podcasts since 2015. There is little documentation or mention of WordPress.com for podcasting it and I have only found one small tutorial about it and that is where you come in. Me: Dedicated Podcast Hosting on WordPress.com? Really? Cmon. Professor: Yes, and I think you are the perfect person to help others learn about WordPress.com as a podcast hosting solution and teach them how use it. Me: Okay, tell me more. I am interested. The truth of the matter was I had not thought about WordPress.com for years and it was indeed off of my tech-radar, but I would play along and try to keep an open mind. My first thought was I know the reason why nobody in the podcast community was talking about podcasting on WordPress.com and that is because WordPress.com was the ‘lite-version’ of WordPress.org. Just how under-the-radar was podcasting on WordPress.com? His response was that he listens and subscribes to every single podcast he can find that talks about podcasting and cannot ever recall anyone teach or explain WordPress.com as a platform for podcasting. There are countless top 10 posts and listicles and articles about the best of the best hosting and WordPress.com never makes any of the lists. do a Google search for “Podcast Hosting Services”, WordPress.com is absent from almost every list. Funny thing was right around this Skype call, this article was making the rounds through Medium and Facebook and all of the Podcast newsletters, called ‘The Ultimate List of Podcasting Hosting Services’ with 27 examples of the podcast hosting services. It had the most obscure podcast hosts, and sure enough. WordPress.com did not make this list. Every google search about podcasting on WordPress is about the self-hosted WordPress.org and not .com. He did find a couple of small blog posts and one small tutorial that was over 6 years old, which makes it all too crazy to me, that podcasting on WordPress.com has been around for a long time, but gets zero mentions. Including from WordPress.com. Translation: WordPress.com as a podcast platform was a ghost. I went back to my initial reaction of WordPress.com as being the hobbyist platform and just thought, well, maybe it’s because it’s not that good right? I kept the interrogation going full speed ahead. I needed more substance. Price is a big deal since a lot of podcasters do it for a hobby. It gets to be an expensive hobby, especially when you start adding in gear. Many podcasters want to test the waters without investing a ton of money. Longevity. WordPress has been around for a long time on the interwebs and over 30% of all websites on the internet run on WordPress.org or WordPress.com. There are a lot of cool and hip fly-by-night solutions that sound awesome and many are free, but you want stability in a podcast host. You want them around for the long-haul. WordPress isn’t going anywhere soon. Flexibility. You can upgrade plans at anytime, you can create multiple shows and private feeds, you can monetize and much more. The Professor: I have 7 podcasts all on WordPress.com that have accumulated over 2.5 million downloads so far and I have not had one technical glitch or one complaint from a listener about not being able to access or download an episode. Well Okay, then. That’s some proof for reliability. Wordpress.com has started advertising on TV and podcasts. They seem to be making a move. Then it hit me. I remember seeing WordPress.com just a month earlier at Podcast Movement 2017 in Anaheim, CA and thought “Hmmm…what are they doing here at a podcast conference?” and didn’t give it too much thought. Off my radar. In hindsight, it almost seems as if they were sitting back in the shadows observing and patiently waiting for the right time to promote their platform as a legitimate hosting solution for podcasters. While I was preparing this guide and tutorial in early 2018, I glanced at the list of sponsors for Podcast Movement 2018 and saw WordPress.com. They were not only a sponsor but a Gold Sponsor. In contrast, Blubrry, Libysn and Podbean were only Silver. The Professor was right; WordPress.com was indeed coming out of the shadows. By the end of the Skype call, I had a new friend and a new adventure that would give me the opportunity to teach, write, podcast, make tutorials and help both new and experienced podcasters. Right up my alley. 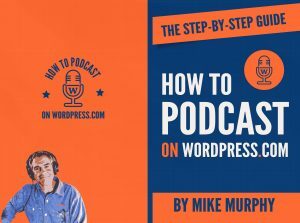 So My why for writing this eBook: How To Podcast on WordPress.com: The Step by Step Guide. It all started with one email from The Professor in the Fall of 2017 and I’m sure grateful I responded with an open mind. If you do get the book, they say reviews on Amazon really help, so if you wrote a quick review, my forever thanks.